Twin Size Sheets for Boys & Girls. 12 Children's Styles Available. Fun patterns and vibrant colors make these sheets perfect for any child. There are twelve styles to choose from, so you are sure to find the perfect set for your boy or girl. These children's sheets are only available in twin size, and they come in three piece sets. You get one fitted sheet, one flat sheet and one pillow case. Each design will be appealing to kids of all ages, and there are six that are more likely to suit a girl, and six that are more geared towards boys. Since these sheets are made from microfiber, you end up with a very durable set, that is incredibly comfortable to sleep on. They can hold up to many washes without showing age, and will last your child for years. Since there are so many pleasing patterns, anyone can find a set to blend with, or match existing decor. Twelve kid-friendly styles make these sheets the perfect choice for any child. Although any style could appeal to any gender, we separate them into boy and girl styles in order to have some organization and make them easier to choose. The camo set features a gray sheet with camouflage styling in other shades of gray. It would be perfect for your soldier in training. The sports set is a darker gray sheet with different full color sports images on it. All of the major sports are covered, so whichever is their favorite, it will be on there. The reptile sheet set is a light blue with green reptiles on it. This one is perfect for any kid that likes turtles or alligators. Have a child that likes cars, trucks and trains? THen the vehicle set would be the ideal choice. It is a medium blue with full color vehicle illustrations of all types driving back and forth. The Rock n Roll set is white with black designs. Notes, instruments, and the phrase " rock n roll" will cover the entire sheet for an exciting, rock inspired design. 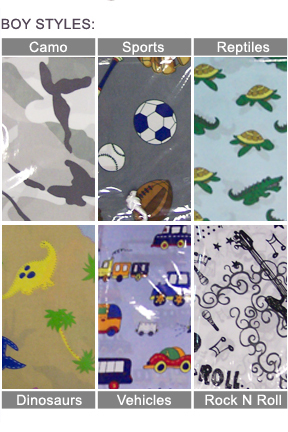 The dinosaur set features a tan sheet with dinosaur and foliage patterning. Many types of dinos are pictured, so this set should appeal to any child that loves them. The monkey set features cute little monkeys on a pink background. Each one will be posed differently or have a unique expression, so this is a fun set for any girl that like animals. The dots set is simple and able to match multiple tastes and decor types. An array of multi-colored dots will be patterned across a white background, and there will be variation in size from row to row. This simple pattern has a wide range of appeal. The peace set features peace signs on a light pink background. The different emblems will vary in color and size, and they are placed in a random style pattern. The pink hearts set has a vibrant medium pink sheet with a pretty busy pattern on it. 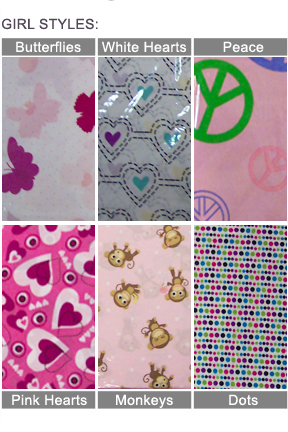 Many shapes and styles of hearts cover the sheet, making it perfect for any little princess. The white hearts set also has a pattern using hearts, but it is quite different. This one has a white background, and a more predictable pattern. Dotted black lines will make up rows of hearts, which are then colored pink and blue in the center. THe butterflies set will appeal to most girls because it is a simple and pretty design. A white background is dotted with light pink circles, and then large, colorful butterflies cover that. Get many of the benefits of an expensive, and fancy set of sheets without the hefty price tag. The microfiber material that these are made from gives the look and feel of egyptian cotton, but at a fraction of the price. 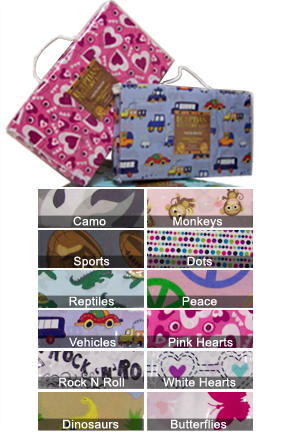 The are a lighter weight than cotton sheets, but are still very durable and long lasting. They feel great on the bed, and remain breathable and comfortable all year long. Your kids will love the fun and unique styles, and you will love the affordable price. Each set comes with tree pieces, and features deep pocket construction. This means that they will fit fine on a regular mattress, but will also work on extra long version, and thick pillow top varieties. Once placed on any bed they have a look of quality. After laying on them you will experience the real value though. These things are incredibly comfortable thanks to the ultra soft finish. Anyone that lays on them will love them, but your kids will be hooked on the looks alone. These Egyptian Comfort 1200 Kids Sheets are the perfect choice for any child. At such an affordable price, you can get several sets, and always have a spare, or get a new set for every twin size bed in your home. They are unbelievably comfortable to lay on, and easy to maintain too. As you wash this set, it will get softer and more comfortable with each load. Unlike other types of bedding, these will come out of the dryer with no wrinkles every time also. What's even better, is that due to the microfiber material, they will actually dry in less time than traditional sheets, so you will save money on your energy bill by using your dryer less. Wash them over and over, because the strong material will hold up and last for years. They are comparable to versions sold at local department stores, but at a fraction of the cost. In many cases you will end up paying more than double for a similar set locally. Looking for some more grown up looking sheets, or ones for a larger bed? Then check out the Egyptian Comfort 800 sets. Order Yours Today! Color Several styles to choose from! * (camo, sports, reptiles, vehicles, rock n roll, dinosaurs, monkeys, dots, peace, pink hearts, white hearts, butterflies ) *all styles may not always be available. Styles not mentioned or pictured may become available in limited quantities. Egyptian Comfort Kids Sheet Set - The perfect addition to any child's room. These kids sheets feature fun patters and vibrant colors. WIth 12 styles to choose from you are sure to find the perfect set of sheets for your boy or girl. Order Yours Today!